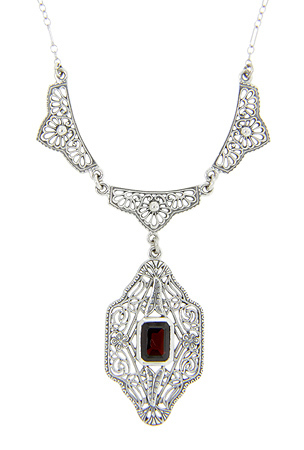 A burgundy colored garnet is surrounded by intricate filigree on this sterling silver antique style necklace. The main pendant portion of the necklace measures 1” in height by 7/16” in width while each of the three smaller portions measure 1 1/2" in width by 3/4” in height. The antique style necklace is a perfect accessory for a bride or bridesmaid. The chain measures ” in length.